The foxglove, under such guises as lady’s fingers, dead men’s bellows, granny bonnets, witch’s thimble, and a host of other fanciful names, has attracted the interest of mankind for centuries. In the United States, the foxglove is cultivated both as a medicinal herb and as an ornamental flowering plant. Herbalists offer two versions of how the plant’s name originated. Foxglove may be a corruption of “folk glove,” the “folk” referring to “little folk” or sprites. Then again, the word may derive from the Anglo-Saxon “foxes-glew,” or “fox music,” which refers to an ancient musical instrument consisting of bells hung on an arched support. The Latin name—Digitalis purpurea—is less troublesome. The man who coined the term, a 16th century Bavarian physician and botanist named Leonard Fuchs, noted that the term “digitalis” is the adjectival form of the Latin word for finger. Fuchs first applied the term “digitus” to the foxglove in his herbal encyclopedia De Historia Stirpium, published in 1542. Fuchs accompanied his drawing of the foxglove with a comment suggesting its effectiveness as a cure for a medical condition called dropsy. Digitalis is the common wild foxglove of England and Western Europe and is propagated today in many varieties and grown throughout the world. 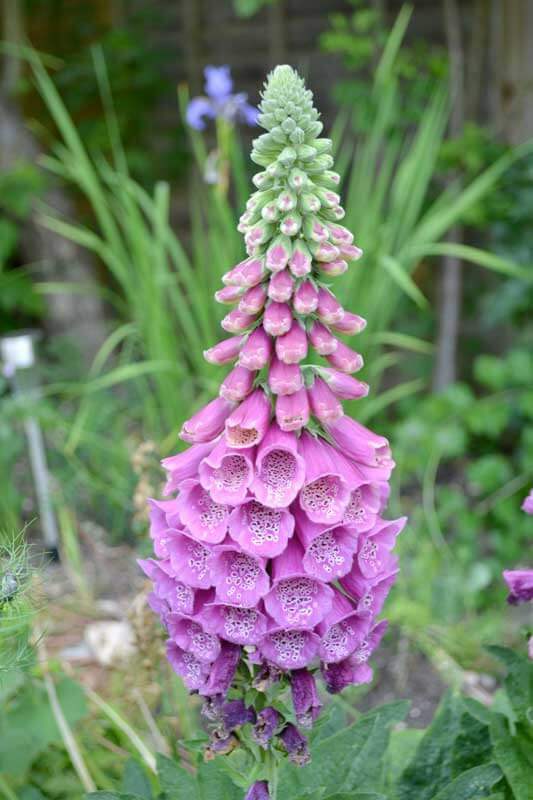 Foxglove is a plant whose profusion of spikes and thimble-shaped, multi-colored blossoms delights gardeners. The variety ‘Gloxiniaeflora’ is one of the old-time favorites. It closely resembles the wild foxglove with its four-foot-tall handsome trusses of gloxinia-like blooms in a variety of colors. Another strain called ‘Shirley’ grows up to six feet tall and has very large flowers. Foxglove grows best when allowed to seed itself, but if a gardener desires to raise it by sown seed, remember that because the seeds are very small and light, they should be mixed with fine sand in order to ensure even distribution. Seeds should be thinly covered with soil. Seedlings may be safely transplanted in damp weather and should be spread from six to nine inches apart. The first year’s growth of foxglove is a rosette of oval leaves. In the second year, the stem rises a yard or more and bears long, pointed leaves. The flowers, springing up in a spire from the rosette of leaves, appear in shades of white, cream, pink, primrose, or purple with their insides spotted with crimson, maroon or chocolate. The life of each flower, from the time the bud opens until the time it slips off its corolla, is about six days. An almost incredible number of seeds are produced—a single foxglove providing one to two million seeds to ensure the plant’s propagation. Because foxgloves grow tall, they are usually planted in groups as a background to a flower border. Or you can position them between tall shrubs to add extra summer color. They are wonderful plants in attracting hummingbirds to your garden. The foxglove is also a favorite flower of the honeybee. The projecting lower lip of the corolla forms an ideal alighting platform for the bee as it pushes its way up the bell to get at the nectar, which lies in a ring around the seed vessel at the top of the flower. Foxglove does fairly well in full sun or light shade, but is happiest in a combination of flickering sunlight and shadows. This makes it an ideal plant where something tall is needed near trees and shrubs. The normal life of a foxglove plant is two seasons, but sometimes the roots, which are formed of numerous long, thick fibers, persist and throw up flowers for several seasons. Joe Zentner is a retired professor and an avid gardener. His published articles have appeared in both regional and national magazines.